Fidel Castro, who ruled Cuba for several years, before he transferred power to his younger brother, Raul Castro, is dead, the younger Castro has announced. Fidel Castro died at the age of 90 years. ​ According to The Mail newspaper, Raul Castro announced the passage of his elder brother and predecessor in office, on Cuba State Television, at 10:29 pm on Friday. 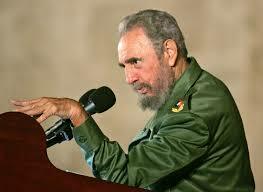 Castro ruled Cuba as a revolutionary leader as prime minister between 1959 and 1976 and as president from 1976 to 2008. Under his administration, Cuba became one-party socialist state; industry and business were nationalized and state socialist reforms implemented throughout the Cuban society, according Wikipedia. He was born in Brian to a wealthy farmer and came into leftist anti-imperialist politics as a student at the University of Havana. After a stint and roles in rebellion against right-wing governments in the Dominican Republic and Colombia, he hatched the overthrow of the government in Cuba under President Fulgencio Batista, but failed. But later succeeded with the formation of a revolutionary movement after a year in jail and began a guerilla warfare against Batista, whom he later overthrew. The United States was opposed to Castro's friendliness with the Soviet Union and wanted to remove him from power through assassination, economic blockade and supporting counter revolutions inside Cuba that included the bay of Pigs invasion of 1961. The development soured the relationship between the U.S and Cuba, with Cuba relying on the Soviets for protection and defense. Dastro is described by Wikipedia as controversial and divisive and decorated with various international awards and his supporters at home and abroad called him a champion of Socialism anti-imperialism, a posture that distanced him from the U.S. However, the other side of his history is that critics view him as totalitarian dictator, whose government undertook several human-rights violations and the exile of hundreds of Cubans. The country's economic was reportedly impoverished due to mass exodus of Cubans. But the free health care, which Fidel introduced in Cuba, is said to be the best anywhere, that other countries are working to emulate, and for which Cubans are very proud. By successfully transferring power to his younger brother, Raul, while still alive, there is every possibility that his legacy will be protected. But one question that anyone may not be able to answer is whether Raul will be able to advance his brother's cause aside from protecting his legacy. Will cuba continue as a Socialist country and for long after Fidel's passage?